By now, you are probably well-versed in what Ben and I are planning to do with our chocolate company. We are really excited about making some fine hand-crafted chocolate that will blow your minds. I know that I considered myself quite the chocolate expert in the past, but that was before I had some authentic bean to bar chocolate. From the moment I tried it, I knew that it was something special, and that I wanted to try my hand at making some myself. Thus far, our enthusiasm for making chocolate has only been tempered by the cost of getting it off the ground. As you are probably aware, cacao beans don’t grow on trees….ok, well yes they do…but the 155lb bags of beans don’t grow on trees, and unfortunately, they can cost a pretty penny depending on the variety of bean and where we are shipping it from. So here we are, balancing the cost of the beans and some additional equipment in order to produce our first line of bars, with the desire to have everyone be our “taste-testers” or “Quality Assurance officers”. The way we figure it, the more people that can tell us if we have some good or bad chocolate, the more successful the chocolate will be. Therefore, Ben and I have set up a creative way for anyone who is interested to become involved: Kickstarter. Kickstarter is a creative project funding mechanism that offers you the ability to provide input and feedback into our chocolate making, while supporting its production. In return for your pledge of support, you can gain different levels of access into the development of our first and future bars. Rewards range from special edition first bars to development bars and exclusive first access to any new bar we create in the future. Our goal is to get $1650 in pledges by July 31st. You can track our progress at our Kickstarter project page or through our homepage. Ben and I really want to make an excellent bar of chocolate, and we recognize that in order to get there, we need your help in getting us off the ground. Please take a look at our Kickstarter project and see if it is something that you are interested in helping with. We are really grateful for your input and feedback in our endeavor, and we hope that you become as excited as we are about having this fine hand-crafted chocolate. 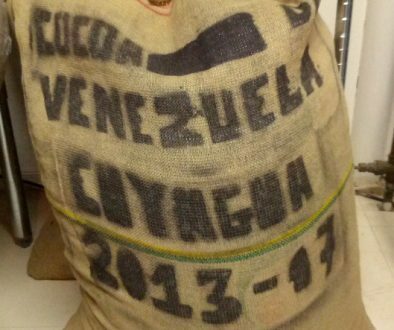 New Origin in Development: Cuyagua, Venezuela!